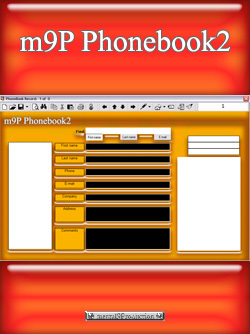 m9P Phonebook2 is highly customizable phonebook manager. It can handle multiple phonebook databases and is capable of exporting a database to a web form for use on the intranet or the internet. Phonebook records can have multiple forms of attachments, i.e., movie, sound, or text file. It is also equipped with an internal media player, a web browser, and a text editor.